Note: This review contains spoilers; if the reader expects to play in a Trail of Cthulhu campaign that features this adventure, proceed accordingly. The Black Drop is an intriguing adventure in several ways. First and perhaps most notable is the fact that a German vessel has arrived at the island, and several of her crew – including an SS officer, are there to save the world from a great evil. This goes against everything we’ve come to expect from Nazis in history and popular culture, so their intentions, particularly to those familiar with the film Raiders of the Lost Ark – will likely come as a great surprise. Second, one or more of the player characters may be called upon to make the ultimate sacrifice for the good of the world. While the possibility of this is a central theme to games involving Cthulhu and the Great Old Ones, it’s rare that such an outcome is so unavoidably certain. The German party is here to prevent the God of the Black Stone from being freed; all have come willingly, and all but one of those participating in the ceremony to contain the dark god will die or go mad. As events transpire, they suddenly find themselves two men short of the absolutely necessary minimum, and desperately need to find replacements in order for their ritual to succeed. Will any of the investigators volunteer for this grisly, suicidal task? Third, the very remoteness of the locale makes getting the characters there and involved in the story something of a challenge. To say that the Kerguelens are off the beaten path is to understate the matter by thousands of miles. The only reason to come anywhere near the Kerguelens would be specifically to visit them, and there’s really no sensible reason for most to do so. Historically, these islands were colonized by French settlers in real life as a potential sheep-raising operation, in much the same way as the Falkland Islands were colonized by the British. The climate and environment of the Kerguelens are suitable for little else, and the mineral wealth of the place is negligible. When the sheep farming proved not to be a viable commercial concern, the enterprise was abandoned. In real life, the Kerguelens today are inhabited by only a few dozen persons – mostly scientists at the French satellite and missile tracking station, geologists and biologists. Sheep are still raised on one of the islands. This setting flies in the face of most Pulp-style games where vicariously experiencing exotic locales form no small fraction of the appeal. Even so, if the GM can make a plausible argument for the presence of the investigators (and a number of solid justifications are offered in this book), the battle is won. The only thing left is to set events in motion and allow the players the room to explore. Author Jason Morningstar has taken a quirky, real-life premise and given it the Lovecraft treatment: what if there was an ancient entity trapped under the island, and what if that entity used its powers to lure some of the resident humans into offering blood sacrifices to it to help it escape? History is full of such odd occurrences that can serve admirably – with a little tweaking – as the backdrop for gaming adventures, and this one seems tailor made for Trail of Cthulhu. The investigators will rapidly be overwhelmed by their physical and psychological isolation from the rest of the world: telecommunications satellites and cell phones don’t exist in the 1930s, nor is there an airstrip there – even to this day. The only way to communicate between the island and the outside world in this time period is through messages delivered by ship, which can take weeks (if there is a ship present to begin with, which is rare.) In the heat of the moment, the investigators will find they have only days – or even hours – to do what needs to be done, with no outside help to be counted on. The Black Drop is an intriguing adventure, suitable for from one to three game sessions. It includes a set of six pre-gen characters to facilitate a quick start to the game. Madness, isolation and a desolate, inhospitable landscape figure prominently; it is even less cheerful – if that’s even possible – than the average Cthulhoid adventure. 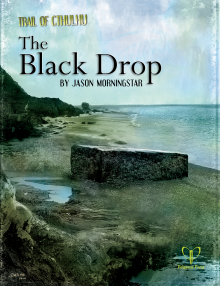 I applaud Mr. Morningstar’s use of the quirky setting and clever premise to craft an worthy adventure in The Black Drop. The opportunity it offers for an incredible and wholly satisfying gaming experience should not be underestimated. Rating: Four out of five stars.